Pictured (seated) Left to Right: Sr. Vice President of Global Port and Destination Development of Carnival Corporation & plc, Giora Israel; Prime Minister of St. Kitts & Nevis, The Hon. Timothy Harris; Minister of Tourism, The Hon. Lindsay F.P. Grant; CEO of Carnival Corporation & plc, Arnold Donald. Pictured (standing) Left to Right: Vice President of Global Port and Destination Development of Carnival Corporation & plc, Stefano Borzone; Chief of Staff to Arnold Donald, Karl Sestak; Vice President of Global Ports and Caribbean Government Relations of Carnival Corporation plc, Marie McKenzie; Ms. Sherelle Hobson of the Prime Minister’s Office Chairman of the Board of Directors of the St. Kitts Tourism Authority, Nicholas Menon; Vice President of Port and Destination Development Operations of Carnival Corporation & plc, David Candib; and Product Development Manager at the St. Kitts Tourism Authority, Melnecia Marshall. On the heels of a record-setting 2017-2018 cruise season, Prime Minister of St. Kitts & Nevis the Hon. Dr. Timothy Harris in conjunction with Minister of Tourism The Hon. Lindsay F.P. Grantmet with top executives from Carnival Corporation & plc to discuss further development of the partnership between the destination and the cruise line. The Prime Minister and Minister Grant welcomed President of Carnival Corporation & plc, Arnold Donald; Sr. Vice President of Global Port and Destination Development, Giora Israel; Vice President of Global Port and Destination Development, Stefano Borzone; Vice President of Port and Destination Development Operations, David Candib; Vice President of Marine, Karl Austin, and Vice President of Global Ports and Caribbean Government Relations, Marie McKenzie. 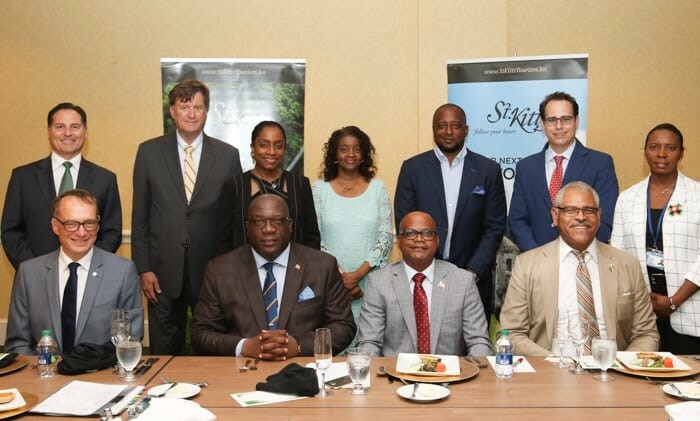 Led by the Prime Minister and Minister Grant, the St. Kitts delegation consisted of Cabinet Secretary, Josephine Huggins; Chairman of the Board of Directors of the St. Kitts Tourism Authority, Nicholas Menon; and the St. Kitts Tourism Authority Product Development Manager, Melnecia Marshall. They spoke with the Carnival team about progress being made on the construction of the second cruise pier at Port Zante, transportation sector standards, public infrastructure development and the identification of clear growth strategies and product enhancement plans to maintain the destination’s strong appeal to the cruise market. Future itineraries that include the destination as a port of call from Carnival Corporation were also discussed.